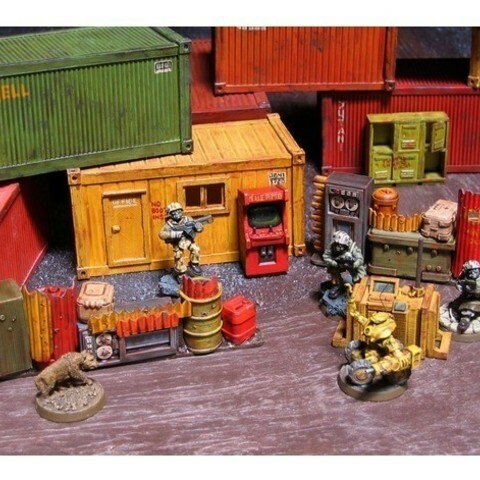 This thing contains a set of 28mm scale modern shipping container end pieces for war gaming. They are designed to be combined with cut panels of hobby store flat and corrugated plastic card for quick and easy mass production. The final containers are bottomless to save material, and allow figure access to the container. Included in the thing are container ends for: Fixed closed, and movable doors, blank and refrigerated style container ends. Additionally a side door and window piece are included to build portable office style containers. PLEASE NOTE: This thing will NOT provide complete containers.  It requires the use of both flat and corrugated plastic card to build finished containers. Assembly and gluing is also required. If you make something interesting with these designs, post a link please. I enjoy seeing what people do with my designs. Regrettably the STL files are not oriented correctly to load into your slicer and print. Please rotate the pieces so they're flat and face up on your print bed. This is because these pieces were my first attempt at 3D design in Fusion 360. 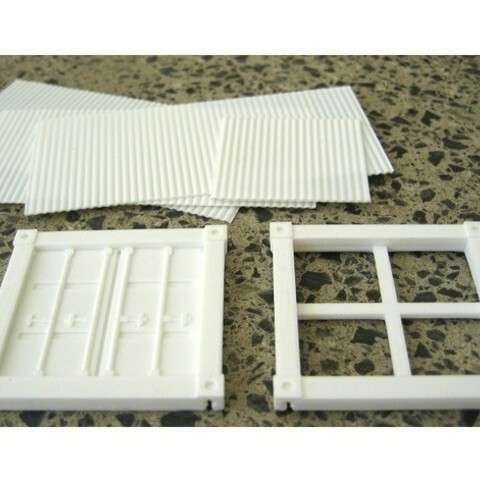 1mm corrugated plastic card - for container roof and side panels. 0.5mm flat plastic card - for container edge trim. Containers can be built to any length, but more than 12cm long may make them too flexible. Cut your corrugated card into three (top, two sides) desired lengths, each 4.5cm wide. The container pieces will print with a rear slot that will hold the corrugated panels. Glue the corrugated panels into these slots on both ends of the container. Please note there are also two additional pieces - the office door and window, that are designed to be slotted into holes cut in a side panel, to construct a 'porta office'. See painted example photo. 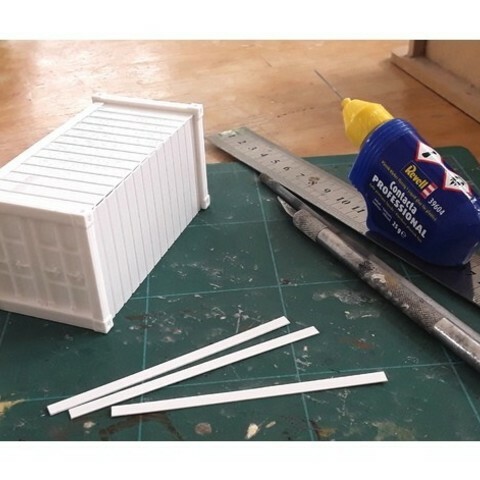 If you're building a container with the simple end frame, you will also require a piece of corrugated plastic card cut into a square, 40mm wide x 38mm high. This is glued into the frame to provide the container end face. The container trim is cut from flat 0.5mm plastic card, 4mm wide and the appropriate length. Glue to the panel edges and corners to provide additional strength and rigidity to the finished container. I print with PLA and use Revell's Liquid Glue for plastics. This will bond the PLA and plastic card together nicely. Also see photos in thing for reference.